Synopsis: On April 26, 1986, a 1,000 feet high flame rises into the sky of the Ukraine. The fourth reactor of the Chernobyl nuclear power plant just exploded. A battle begins in which 500,000 men are engaged throughout the Soviet Union to "liquidate" the radioactivity, build the "sarcophagus" of the damaged reactor and save the world from a second explosion that would have destroyed half of Europe. 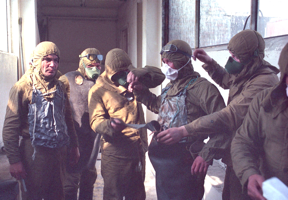 Become a reference film, this documentary combines testimonials and unseen footage, tells for the first time the Battle of Chernobyl.